This page is being continually updated as I discover new resources. For the most up-to-date information, be sure to start by checking out my Pinterest board on Earth Day. Primera Escuela has a good number of activity sheets for parents to download. Best for preschoolers. ABCTeach has a lot of great printables for Earth Day. Be sure to take a look at Enchanted Learning's site. They have a ton of crafts that are related to the earth and wildlife. 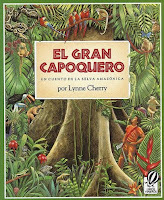 For older children, teachers be sure to check out Canopy in the Clouds. I wrote about this incredible site a while ago, and now their Spanish site, dosel en las nubes, is up and running! Proyecto Bosk is a Spanish website for children that helps students think about climate change, global warming and care for the forests. Download the 30-page "actividades" booklet for excellent handouts for students. The Latin Baby Book Club just posted a tutorial for how to make your own bilingual book using recycled materials. No Time for Flash Cards has a cute tutorial on how to make a (recycled) earth. Spanish Earth Day or Environmental Unit Vocabulary and Activities from Liz's Lessons. Me on the Map bilingual activity in Spanish or English by Mrs. Castro. Reciclando en la escuela is a fabulous site, written completely in Spanish, with some of the most imaginative ideas for recycling materials into educational tools/toys/activities. The Magnifying Glass is another favorite of mine. And all this week this nature blog has been celebrating Earth Day. Go have a look-see. What Eats? is a food website for kids. Lots of easy information here that will fascinate your littles. • Imagina un mundo mejor by Yanitzia Canetti. 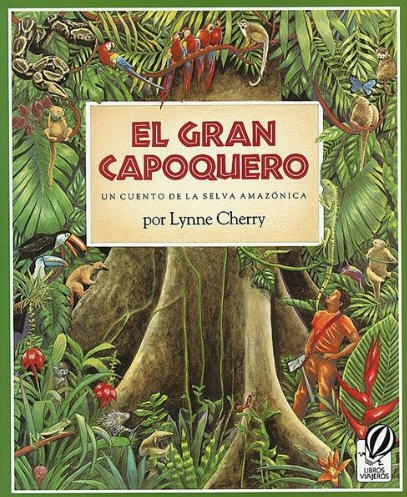 • Check out the Latin Baby Book Club's bilingual/bicultural book list for Earth Day.